The science of Kriya Yoga, mentioned so often in these pages, became widely known in modern India through the instrumentality of Lahiri Mahasaya, my guru’s guru. The Sanskrit root of Kriya is kri, to do, to act and react; the same root is found in the word karma, the natural principle of cause and effect. Kriya Yoga is thus “union (yoga) with the Infinite through a certain action or rite.” A yogi who faithfully follows its technique is gradually freed from karma or the universal chain of causation. Because of certain ancient yogic injunctions, I cannot give a full explanation of Kriya Yoga in the pages of a book intended for the general public. The actual technique must be learned from a Kriyaban or Kriya Yogi; here a broad reference must suffice. Kriya Yoga is a simple, psychophysiological method by which the human blood is decarbonized and recharged with oxygen. The atoms of this extra oxygen are transmuted into life current to rejuvenate the brain and spinal centers. 1 By stopping the accumulation of venous blood, the yogi is able to lessen or prevent the decay of tissues; the advanced yogi transmutes his cells into pure energy. Elijah, Jesus, Kabir and other prophets were past masters in the use of Kriya or a similar technique, by which they caused their bodies to dematerialize at will. Kriya is an ancient science. 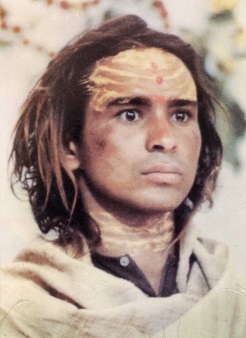 Lahiri Mahasaya received it from his guru, Babaji, who rediscovered and clarified the technique after it had been lost in the Dark Ages. Krishna also relates3 that it was he, in a former incarnation, who communicated the indestructible yoga to an ancient illuminato, Vivasvat, who gave it to Manu, the great legislator.4 He, in turn, instructed Ikshwaku, the father of India’s solar warrior dynasty. Passing thus from one to another, the royal yoga was guarded by the rishis until the coming of the materialistic ages.5 Then, due to priestly secrecy and man’s indifference, the sacred knowledge gradually became inaccessible. Kriya Yoga is mentioned twice by the ancient sage Patanjali, foremost exponent of yoga, who wrote: “Kriya Yoga consists of body discipline, mental control, and meditating on Aum.“6 Patanjali speaks of God as the actual Cosmic Sound of Aum heard in meditation.7 Aum is the Creative Word,8 the sound of the Vibratory Motor. Even the yoga-beginner soon inwardly hears the wondrous sound of Aum. Receiving this blissful spiritual encouragement, the devotee becomes assured that he is in actual touch with divine realms. St. Paul knew Kriya Yoga, or a technique very similar to it, by which he could switch life currents to and from the senses. He was therefore able to say: “Verily, I protest by our rejoicing which I have in Christ, I die daily.” 10 By daily withdrawing his bodily life force, he united it by yoga union with the rejoicing (eternal bliss) of the Christ consciousness. In that felicitous state, he was consciously aware of being dead to the delusive sensory world of maya. The Kriya Yogi mentally directs his life energy to revolve, upward and downward, around the six spinal centers (medullary, cervical, dorsal, lumbar, sacral, and coccygeal plexuses) which correspond to the twelve astral signs of the zodiac, the symbolic Cosmic Man. One-half minute of revolution of energy around the sensitive spinal cord of man effects subtle progress in his evolution; that half-minute of Kriya equals one year of natural spiritual unfoldment. The astral system of a human being, with six (twelve by polarity) inner constellations revolving around the sun of the omniscient spiritual eye, is interrelated with the physical sun and the twelve zodiacal signs. All men are thus affected by an inner and an outer universe. The ancient rishis discovered that man’s earthly and heavenly environment, in twelve-year cycles, push him forward on his natural path. The scriptures aver that man requires a million years of normal, diseaseless evolution to perfect his human brain sufficiently to express cosmic consciousness. One thousand Kriya practiced in eight hours gives the yogi, in one day, the equivalent of one thousand years of natural evolution: 365,000 years of evolution in one year. In three years, a Kriya Yogi can thus accomplish by intelligent self-effort the same result which nature brings to pass in a million years. The Kriya short cut, of course, can be taken only by deeply developed yogis. With the guidance of a guru, such yogis have carefully prepared their bodies and brains to receive the power created by intensive practice. The Kriya beginner employs his yogic exercise only fourteen to twenty-eight times, twice daily. A number of yogis achieve emancipation in six or twelve or twenty-four or forty-eight years. A yogi who dies before achieving full realization carries with him the good karma of his past Kriya effort; in his new life he is harmoniously propelled toward his Infinite Goal. The body of the average man is like a fifty-watt lamp, which cannot accommodate the billion watts of power roused by an excessive practice of Kriya. Through gradual and regular increase of the simple and “foolproof” methods of Kriya, man’s body becomes astrally transformed day by day, and is finally fitted to express the infinite potentials of cosmic energythe first materially active expression of Spirit. Kriya Yoga has nothing in common with the unscientific breathing exercises taught by a number of misguided zealots. Their attempts to forcibly hold breath in the lungs is not only unnatural but decidedly unpleasant. Kriya, on the other hand, is accompanied from the very beginning by an accession of peace, and by soothing sensations of regenerative effect in the spine. The ancient yogic technique converts the breath into mind. By spiritual advancement, one is able to cognize the breath as an act of minda dream-breath. Many illustrations could be given of the mathematical relationship between man’s respiratory rate and the variations in his states of consciousness. A person whose attention is wholly engrossed, as in following some closely knit intellectual argument, or in attempting some delicate or difficult physical feat, automatically breathes very slowly. Fixity of attention depends on slow breathing; quick or uneven breaths are an inevitable accompaniment of harmful emotional states: fear, lust, anger. The restless monkey breathes at the rate of 32 times a minute, in contrast to man’s average of 18 times. The elephant, tortoise, snake and other animals noted for their longevity have a respiratory rate which is less than man’s. The tortoise, for instance, who may attain the age of 300 years,12 breathes only 4 times per minute. The rejuvenating effects of sleep are due to man’s temporary unawareness of body and breathing. The sleeping man becomes a yogi; each night he unconsciously performs the yogic rite of releasing himself from bodily identification, and of merging the life force with healing currents in the main brain region and the six sub-dynamos of his spinal centers. The sleeper thus dips unknowingly into the reservoir of cosmic energy which sustains all life. The voluntary yogi performs a simple, natural process consciously, not unconsciously like the slow-paced sleeper. The Kriya Yogi uses his technique to saturate and feed all his physical cells with undecaying light and keep them in a magnetized state. He scientifically makes breath unnecessary, without producing the states of subconscious sleep or unconsciousness. By Kriya, the outgoing life force is not wasted and abused in the senses, but constrained to reunite with subtler spinal energies. By such reinforcement of life, the yogi’s body and brain cells are electrified with the spiritual elixir. Thus he removes himself from studied observance of natural laws, which can only take himby circuitous means as given by proper food, sunlight, and harmonious thoughts to a million-year Goal. It needs twelve years of normal healthful living to effect even slight perceptible change in brain structure, and a million solar returns are exacted to sufficiently refine the cerebral tenement for manifestation of cosmic consciousness. Untying the cord of breath which binds the soul to the body, Kriya serves to prolong life and enlarge the consciousness to infinity. The yoga method overcomes the tug of war between the mind and the matter-bound senses, and frees the devotee to re-inherit his eternal kingdom. He knows his real nature is bound neither by physical encasement nor by breath, symbol of the mortal enslavement to air, to nature’s elemental compulsions. Introspection, or “sitting in the silence,” is an unscientific way of trying to force apart the mind and senses, tied together by the life force. The contemplative mind, attempting its return to divinity, is constantly dragged back toward the senses by the life currents. Kriya, controlling the mind directly through the life force, is the easiest, most effective, and most scientific avenue of approach to the Infinite. In contrast to the slow, uncertain “bullock cart” theological path to God, Kriya may justly be called the “airplane” route. The yogic science is based on an empirical consideration of all forms of concentration and meditation exercises. Yoga enables the devotee to switch off or on, at will, life current from the five sense telephones of sight, sound, smell, taste, and touch. Attaining this power of sense-disconnection, the yogi finds it simple to unite his mind at will with divine realms or with the world of matter. No longer is he unwillingly brought back by the life force to the mundane sphere of rowdy sensations and restless thoughts. Master of his body and mind, the Kriya Yogi ultimately achieves victory over the “last enemy,” death. The life of an advanced Kriya Yogi is influenced, not by effects of past actions, but solely by directions from the soul. The devotee thus avoids the slow, evolutionary monitors of egoistic actions, good and bad, of common life, cumbrous and snail-like to the eagle hearts. The superior method of soul living frees the yogi who, shorn of his ego-prison, tastes the deep air of omnipresence. The thralldom of natural living is, in contrast, set in a pace humiliating. Conforming his life to the evolutionary order, a man can command no concessionary haste from nature but, living without error against the laws of his physical and mental endowment, still requires about a million years of incarnating masquerades to know final emancipation. The telescopic methods of yogis, disengaging themselves from physical and mental identifications in favor of soul-individuality, thus commend themselves to those who eye with revolt a thousand thousand years. This numerical periphery is enlarged for the ordinary man, who lives in harmony not even with nature, let alone his soul, but pursues instead unnatural complexities, thus offending in his body and thoughts the sweet sanities of nature. For him, two times a million years can scarce suffice for liberation. Gross man seldom or never realizes that his body is a kingdom, governed by Emperor Soul on the throne of the cranium, with subsidiary regents in the six spinal centers or spheres of consciousness. This theocracy extends over a throng of obedient subjects: twenty-seven thousand billion cellsendowed with a sure if automatic intelligence by which they perform all duties of bodily growths, transformations, and dissolutionsand fifty million substratal thoughts, emotions, and variations of alternating phases in man’s consciousness in an average life of sixty years. Any apparent insurrection of bodily or cerebral cells toward Emperor Soul, manifesting as disease or depression, is due to no disloyalty among the humble citizens, but to past or present misuse by man of his individuality or free will, given to him simultaneous with a soul, and revocable never. Identifying himself with a shallow ego, man takes for granted that it is he who thinks, wills, feels, digests meals, and keeps himself alive, never admitting through reflection (only a little would suffice!) that in his ordinary life he is naught but a puppet of past actions (karma) and of nature or environment. Each man’s intellectual reactions, feelings, moods, and habits are circumscribed by effects of past causes, whether of this or a prior life. Lofty above such influences, however, is his regal soul. Spurning the transitory truths and freedoms, the Kriya Yogi passes beyond all disillusionment into his unfettered Being. All scriptures declare man to be not a corruptible body, but a living soul; by Kriya he is given a method to prove the scriptural truth. “Outward ritual cannot destroy ignorance, because they are not mutually contradictory,” wrote Shankara in his famous Century of Verses. “Realized knowledge alone destroys ignorance. . . . Knowledge cannot spring up by any other means than inquiry. ‘Who am I? How was this universe born? Who is its maker? What is its material cause?’ This is the kind of inquiry referred to.” The intellect has no answer for these questions; hence the rishis evolved yoga as the technique of spiritual inquiry. Kriya Yoga is the real “fire rite” often extolled in the Bhagavad Gita. The purifying fires of yoga bring eternal illumination, and thus differ much from outward and little-effective religious fire ceremonies, where perception of truth is oft burnt, to solemn chanted accompaniment, along with the incense! 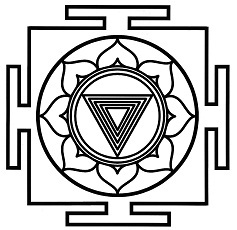 The advanced yogi, withholding all his mind, will, and feeling from false identification with bodily desires, uniting his mind with superconscious forces in the spinal shrines, thus lives in this world as God hath planned, not impelled by impulses from the past nor by new witlessnesses of fresh human motivations. Such a yogi receives fulfillment of his Supreme Desire, safe in the final haven of inexhaustibly blissful Spirit. The yogi offers his labyrinthine human longings to a monotheistic bonfire dedicated to the unparalleled God. This is indeed the true yogic fire ceremony, in which all past and present desires are fuel consumed by love divine. The Ultimate Flame receives the sacrifice of all human madness, and man is pure of dross. His bones stripped of all desirous flesh, his karmic skeleton bleached in the antiseptic suns of wisdom, he is clean at last, inoffensive before man and Maker. 1 The noted scientist, Dr. George W. Crile of Cleveland, explained before a 1940 meeting of the American Association for the Advancement of Science the experiments by which he had proved that all bodily tissues are electrically negative, except the brain and nervous system tissues which remain electrically positive because they take up revivifying oxygen at a more rapid rate. 4 The author of Manava Dharma Shastras. These institutes of canonized common law are effective in India to this day. The French scholar, Louis Jacolliot, writes that the date of Manu “is lost in the night of the ante-historical period of India; and no scholar has dared to refuse him the title of the most ancient lawgiver in the world.” In La Bible dans l’Inde, pages 33-37, Jacolliot reproduces parallel textual references to prove that the Roman Code of Justinian follows closely the Laws of Manu. 5 The start of the materialistic ages, according to Hindu scriptural reckonings, was 3102 B.C. This was the beginning of the Descending Dwapara Age (see page 174). Modern scholars, blithely believing that 10,000 years ago all men were sunk in a barbarous Stone Age, summarily dismiss as “myths” all records and traditions of very ancient civilizations in India, China, Egypt, and other lands. 6 Patanjali’s Aphorisms, II:1. 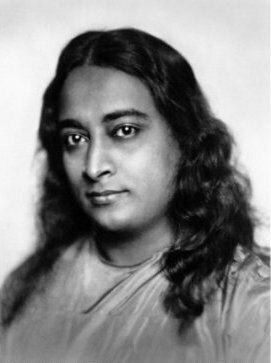 In using the words Kriya Yoga, Patanjali was referring to either the exact technique taught by Babaji, or one very similar to it. That it was a definite technique of life control is proved by Patanjali’s Aphorism II:49. 8 “In the beginning was the Word, and the Word was with God, and the Word was God. . . . All things were made by him; and without him was not any thing made that was made.”-John 1:1-3. Aum (Om) of the Vedas became the sacred word Amin of the Moslems, Hum of the Tibetans, and Amen of the Christians (its meaning in Hebrew being sure, faithful). “These things saith the Amen, the faithful and true witness, the beginning of the creation of God.”-Revelations 3:14. 10 I Corinthians 15:31. “Our rejoicing” is the correct translation; not, as usually given, “your rejoicing.” St. Paul was referring to the omnipresence of the Christ consciousness. 11 Kalpa means time or aeon. Sabikalpa means subject to time or change; some link with prakriti or matter remains. Nirbikalpa means timeless, changeless; this is the highest state of samadhi. 12 According to the Lincoln Library of Essential Information, p. 1030, the giant tortoise lives between 200 and 300 years.